Zambeza took the genetics of two excellent strains, the highly-efficient Critical and the legendary OG Kush to make their Power Kush. Looking at the superb qualities of this Sativa-dominant hybrid, her crazy potency, high yields, super-short flowering time and great flavour, we are confidently saying that Power Kush is yet another homerun for Zambeza and that the strain truly earns her name! Zambeza doesn’t do half-assed things and when they set out to create a new strain, expectations are usually (and rightfully so) always high. For their Power Kush, they took the acclaimed Critical who by herself enjoys huge popularity among cannabis enthusiasts and crossed her with the legendary OG to bring us a Kush that stands out in every aspect. One of the remarkable characteristics of Power Kush is her exceptionally short flowering time of only 50 days. This means that when you grow her indoors, you can expect yields of up to 475-525g/m² in record time without any long wait. The plant will normally get to a convenient height of 60-80cm which can make her a very good choice even for smaller spaces and grow rooms. Outdoors, in good conditions, Power Kush can yield as high as 600g per plant where she can grow up to 170cm. With 20% of THC, Power Kush delivers a very potent smoke like you’d expect from such a “Power Kush”, a smoke that sure won’t disappoint even seasoned cannabis lovers. But while Kushes are normally typical night-time strains that you would enjoy for their deeply relaxing if not outright narcotic effect, Power Kush combines her powerful body stone with a pleasant head rush that gives you creativity and energy, which makes her also suitable for daytime use, despite her impressive potency. Her taste and aroma won't let you down either. She blends sweet aromas with some slightly spicy and sour tones from the OG, making for a very enjoyable taste that is perfectly rounding off this deeply satisfying smoke experience. We at Zambeza did the obvious when we named their Power Kush, since this is a Kush that can easily outperform others when it comes to potency and aroma. Stellar genetics make this high-yielder easy to grow where she’ll reward with an abundance of top-grade Kush bud in a ridiculous short flowering time. Short: This Kush is pretty much perfect and sure won’t disappoint the Kush lovers out there! 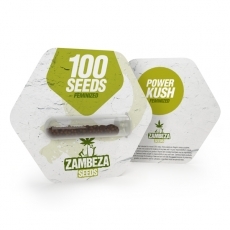 Power Kush bulk seeds are available in packs of 100 seeds so that growers can stock up on seeds of this highly-rewarding Kush.